Full Throttle Media is working on a cutting edge video delivery system for the sport fishing audience. But, the fragmented availability of distribution platforms, operating systems and browsers increases the complexity associated with publishing video. We are working hard to bring in all the resources necessary to execute on this endeavor. If you have any expertise in the area of delivering downloadable video to mobile devices, we have open ears and minds. There are a hell of a lot of gaps in what's available out there to companies that are not Apple, Netflix, Hulu or Amazon. The BIG Game Legends Interview Series is being re-edited for use with the Sport Fishing Safari production. This is a long process of looking through hours of footage to grab the very best clips and sound bites. I have just, in the past couple of days, finished work on the Allen Merritt and Alfred Glassell interviews. Allen Merritt was a real pleasure to listen to, with his endless stories about the hey days of growing up in S. Florida. Today, I am on the James Roberts interview that was filmed in Madeira a few years ago. With a lot of viewing, reviewing and scribbling notes ahead, I decided to pop some corn and grab a few cans of coke (regular coke botted in Central America with real sugar, not the fake crap) and settle in for a long stretch. I hope to have the first of this series out by the first of the year. More updates will be forth coming. Through my work as a film maker and interviewer, I am exposed to some damn intelligent folks who have spent much of their lives on the water and have a far better understanding of what is going on with the oceans than I. It is my believe that we should all advocate for better fisheries management and oceans protection. For full disclosure, I am an avid sport fisherman and do not believe in the indiscriminate closure of fisheries. I just think we as users of this planets resources could come up with a better, less agenda driven, management plan for our oceans that is based on sound analysis. I am by no means a wild eyed environmental nut case who promulgates radical anti-business or development agendas. I am a capitalist, but I am, however, struck by what is going on in our oceans. Song Of the Spindle from Drew Christie on Vimeo. Full Throttle Media will soon release a collection of conversations with several of big game fishing's most respected and reverred captains, anglers and crew. We started this project several years ago, but only now felt the timing was right to roll the project out. Several of the most well known participants in this project have passed away since filming. And, to the flame never died in any of them. Those that are still with us carry the mantle. I wish to thank each and every one who helped in this endeavor. BIG Game Legends is a collection of the most incredible interviews ever shot with some of big game fishing’s greatest explorers and their first hand tales of heading into the blue. These sportsmen experienced the most superb big game fishing the world will ever see. It is through their spirit of adventure that an industry was born. Through these interviews we trace the history of heavy tackle big game fishing from its early days in Bimini and Wedgeport, to one of singular defining moments for the sport in Cabo Blanco, to the development of the big game fishing culture in the deep waters off of Kona, Cairns, Madeira and beyond. These far flung destinations were brought to fame by a group of extraordinary adventurers that forged the roots of what would become one of the world’s most challenging sports endeavors. Men who, compelled to do what was considered impossible, began plying the waters for bigger and bigger fish, testing the limitations of endurance and equipment to catch that one fish. BIG Game Legends is the story of these big game anglers, of where and how their journey began, of pioneers who chased their dreams across the oceans and of anglers who still do, hoping for that freight train to enter the spread. You will meet Alfred Glassell, one of the sport’s greatest pioneer, whose tireless love and contribution to the fishing will forever be the mark by which all big game anglers are measured. George Parker, in his final days, shares his love and enthusiasm for fishing and how the sport shaped his family. Then there is Allen Merritt, one of the greatest fishermen Cat Key’s tuna alley will ever know and an inspiration behind the development of today’s most revered fishing yachts. Record setting duo Stewart Campbell and Bark Garnsey share their amazing experiences. Roddy Hays, doing what no fisherman ever will again, reveals how a deep passion for the sport carried him to heights unreachable. You will also hear from Peter Bristow, Peter Fithian, Mike Benitez, Marlin Parker, Clay Hensley, James Roberts and many more to come who have left their mark on a culture and an industry. In telling their stories we are welcomed into the inner circle of heavy tackle big game fishing. These pioneering adventurers are the heart of Big Game Legends and the roots of an entire industry. It is their spirit and sacrifice that formed a culture and created a lifestyle. Big Game Legends is a testament to the desire that all anglers have, in one form or another, for that one fish. This is so profoundly true! I found something I love to do about a decade ago and am so happy for it. I stumbled upon the Full Throttle Media idea, but with so many great experiences the hand of serendipity is usually at play. Thank you Steve Jobs for reminding me how lucky I am. Filming of the first phase of the BIG Game Fishing Primer begins this week. The Full Throttle Media team is heading to South Florida to prepare for the production. 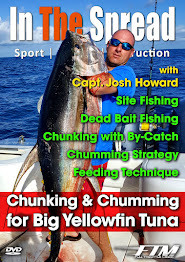 The BIG Game Fishing Primer is part of the larger Sport Fishing Safari media project. Specific details on the Primer will be released post filming.